Known for their sleep, relaxation, and laid-back lifestyle, it is easy to see why so many are fascinated by sloths. Here are just five interesting facts on what makes sloths so popular. You are most likely to find sloths residing in Central and South America. The areas they inhabit have countless tall trees that give sloths the ability to move around, eat, and sleep in a comfortable environment. Most of a sloth’s day consists of sleeping from 15 to 20 hours with the remainder being used for eating and relaxing. Also, sloths only really leave their natural habitat to use the bathroom or to go swimming. Regarded as the slowest animal on earth, it is clear to see how their lack of speed is reflected in how they spend their days. As sloths spend most of their time up above, naturally, the mating process happens there too. The courting process revolves around a group of male sloths hanging from branches to attract and win the attention of the female. Sloths can only give birth to one baby at a time with the pregnancy span lasting from 5-11 months (dependent on the type of sloth). When the baby is born, they are known to stay by their mother’s side for 3-4 years before moving on. Whilst the main diet for a three-toed sloth consist of leaves, they are also known to eat twigs and occasional fruits. As a sloth has a four-part stomach, digesting the leaves can take a long time with one meal typically taking up to a month to digest. As leaves are not a big source of energy or nutrition, this results in sloths being slow and unproductive in their day-to-day life. When they are not in the trees, sloths can be found taking a swim in the lakes and rivers below. A fascinating fact about sloths is that whilst they are slow in their environment, they are known to be incredibly good swimmers. Sloths can hold their breath underwater for up to 40 minutes because they are able to slow their heart rate down and they can move three times as fast in water as they do on land. 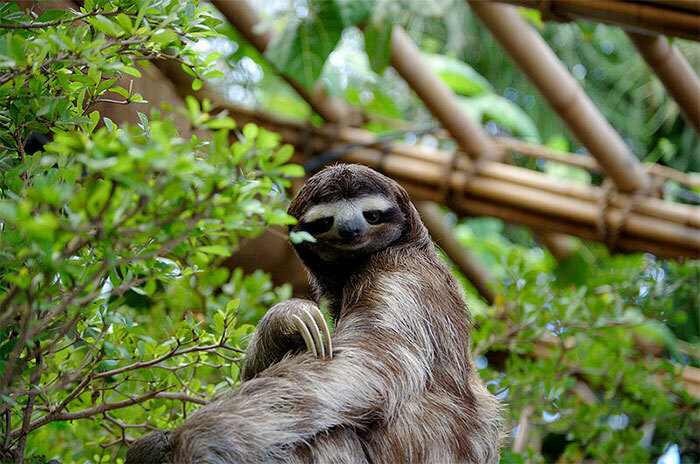 Whilst sloths are usually safe and secure up in the trees, they tend to drop to the ground to use the bathroom. However, with next to no power in their back legs, making the trip can be incredibly dangerous for them. Because they must slide and drag themselves across the ground using their front claws, this puts them in a vulnerable and dangerous situation. As a bathroom trip can take a considerable amount of time, this makes them susceptible to attacks from other animals. However, sloths produce no body odor or sweat, which can help steer predators away. If you would like to know more information and facts on sloths, make sure you look online at the variety of websites available that can help give you more of an understanding on the animal and what makes them so unique and different. Leana Thorne is an experienced lifestyle and tech blogger who has contributed to a number of leading blogs in the field. She is constantly learning new things and she is always happy to share her knowledge with others.